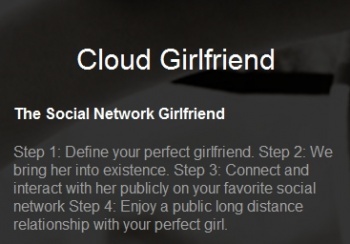 Cloud Girlfriend hopes to be a one-stop shop for the world's virtual girlfriend needs. Sick of not having a significant other like all of your friends on Facebook? Well, be sick no more, because Cloud Girlfriend is here to save the day. When Cloud Girlfriend launches, it'll allow a user to define his/her perfect girlfriend, and then the service will create her. Cloud Girlfriend doesn't work quite like Weird Science though. Instead, it creates this girlfriend in the social networking world. Social network users can then "connect" with the virtual girlfriend on services such as Facebook. One purpose for the service might be to make the actual mate that users are pining after jealous, and more likely to desire them. It could backfire, though, as Cloud Girlfriend users would have to constantly make up lies about where they've been, or why they can't go on a double date. Specific details on how Cloud Girlfriend works aren't available yet, but it'll supposedly leave messages on your Facebook wall amongst other actions. There are a lot of kinks that might need to be worked out, such as whose photos the service will use for each girlfriend. In addition, Cloud Girlfriend probably violates Facebook's Terms of Service, which says that accounts have to belong to real people. If Facebook can't figure out how to filter virtual girlfriends though, we'll all have to be suspect of friends' "in a relationship" posts in the future.